Often called "black henna" or "neutral henna" tattoos, these patterns painted onto your skin are readily available abroad. They may also be available in the UK, at festivals and fairs, and to buy online. But the black paste used in these temporary tattoos may contain high levels of a chemical dye so powerful and toxic that it is illegal to use it on the skin in this way. 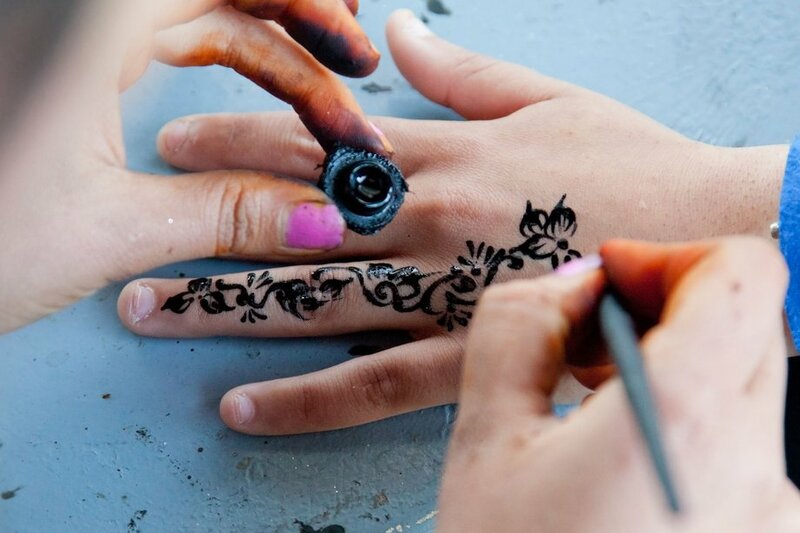 The risks of black henna lie in the paste's ingredients – specifically, a chemical called paraphenylenediamine (PPD). Dr Chris Flower, director general of the Cosmetic, Toiletry and Perfumery Association, explains: "PPD is safely and legally used in permanent hair dyes where clear instructions are given, and where the maximum level is controlled by law. But black henna often contains PPD at high levels, to give a dark colour quickly. "When applied to the skin in the form of a black henna temporary tattoo, PPD can cause chemical burns and lead to allergic reactions." Dr Flower says that everyone should be suspicious of black "tattoos". "Real henna is never black, but is orange-brown," he explains. "Any very dark temporary tattoo should be treated with caution." Lisa Bickerstaffe at the British Skin Foundation agrees. "Check the colour if a product is described as 'henna'," she says. "Henna is an orange-red colour, so if you are offered a temporary tattoo with 'black henna', it isn't actually true henna. If in doubt, stay away." If there is no list of ingredients, do not use the product. Not everyone has a reaction to black henna, but it can be painful if you do. "The signs range from discomfort, such as burning or tingling, to painful stinging, swelling, redness and blistering of the skin," says Dr Flower. "This can become very severe and lead to permanent scarring of the skin in the outline of the tattoo." If you get a reaction like this, contact a doctor immediately and tell them what has happened. "Mention if this is the first time you have had such a tattoo, or if you have had one before, and whether you have ever had any reaction to hair dye in the past," says Dr Flower. "You will probably be treated for chemical burns and possibly allergic reactions." If the reaction persists or gets worse, go back to the doctor, as the painted area can also become infected. And it's not just black henna tattoos you might be allergic to. Bickerstaffe warns: "The reaction can lead to contact dermatitis and may mean that your skin is more susceptible to reacting to other PPD products, such as hair dye, in the future." This means that if you come into contact with PPD again in the future, even years later, you can have a very serious allergic reaction. Allergic reactions can get worse over time, and you might not even realise you have become sensitised. The inquest into Julie McCabe's death heard that 5 years earlier she had had a black henna tattoo abroad. Since then, she had used her regular hair dye several times and experienced some reactions, such as itching and rashes. Tragically, the last time she used the hair dye, she had a very serious anaphylactic reaction and died. Such a serious reaction is rare, but it is a potential danger. "If you have had a reaction to a black henna temporary tattoo, it is quite likely you have become allergic to PPD, and you should be extremely careful before colouring your hair," advises Dr Flower. "Even if you have not had a reaction to such a tattoo, you will not know if you have been sensitised to PPD, so you could react the next time you encounter it – for example, in hair colourant. "You must follow the hair dye instructions carefully, particularly regarding the Allergy Alert Test." Bickerstaffe advises getting tested to see if you have become sensitised to PPD. "If your skin reacts to black henna, then seek advice and a patch test from your doctor or dermatologist," she says. "The patch test will help determine whether the reaction was due to PPD and therefore whether you should avoid hair dye. It is unlikely you will be able to use permanent hair dye again after reacting to black henna." PPD is also found in other items, including rubbers and inks, so if you have an unexpected reaction to everyday products and seek treatment, tell your doctor or pharmacist about your sensitivity to PPD. If you know you have become sensitised to PPD, do not use any hair dye containing PPD, or similar dyes such as p-toluenediamine (PTD). If you are going to dye your hair, Dr Flower explains what to look for on the label: "The name of the hair dye has to be listed in the ingredient list on the pack – look out for p-Phenylenediamine or Toluene-2,5-diamine. "It is also a legal requirement that all such hair dyes in Europe say 'Contains phenylenediamines' or 'Contains phenylenediamines (toluenediamines)' on the label, and these must be avoided." Every hair dye product in the UK is required to provide information about carrying out an Allergy Alert Test, to see if you will have a reaction to the dye. You should do this test before each time you use hair dye, even if you have used the dye before. "If you react to an Allergy Alert Test, you must not go on and colour your hair, and you should contact the manufacturer," says Dr Flower. "Although it does require a dermatologist to confirm a diagnosis of allergy or sensitisation to PPD, a reaction to either a black temporary tattoo or to an Allergy Alert Test must not be ignored." There will be a careline or helpline number on the hair dye pack for you to call. "This means the manufacturer will be aware that someone has experienced a reaction to their product," explains Dr Flower. "They will then be able to advise further on what action to take next, which will probably involve contacting your GP." Your GP may refer you to a skin specialist, such as a dermatologist, who can diagnose the cause, advise on how to treat it and help you to avoid future reactions. If you have had a black temporary tattoo in the past, try not to worry. Don't have another one, and remember to follow the instructions, particularly the Allergy Alert Test, if you use hair dye. Bear in mind that allergic reactions can get worse over time. This means that even if you or your child has had a mild reaction in the past, any future reaction could be more severe. If you have not had such a tattoo in the past, keep it that way. "Don't ever have a black henna temporary tattoo," says Dr Flower. "And no matter how much your children pester you, never let them have one either." Katy Borluvie had an allergic reaction to a black henna temporary tattoo she got on holiday. She found out the hard way about the illegal ingredients in her tattoo. "I had noticed a steady stream of people visiting a tattoo stall by the pool in the Gambia," says Katy. "I just made a spur-of-the-moment decision to get a pretty pattern drawn in black henna below my collarbone. I thought it would look really nice. "It was a decision I now regret, because I didn't know what the consequences could be." The tattoo artist painted on the design Katy wanted, but straight away she felt a burning sensation and knew something was wrong. Her skin blistered soon afterwards. "It was incredibly painful and sensitive, and looked terrible," says Katy. "I didn't realise that the black paste in black henna can contain toxic ingredients like PPD. I had never even heard that what's in black henna – stuff I let them put straight onto my skin – can be really risky." There was PPD in Katy's temporary tattoo and she developed an allergy to the chemical. She had a visible scar for the next 6 months. Katy says: "I used to colour my hair all the time, but because I’m now allergic to PPD, I'm too scared to ever colour my hair again. I don't want to get a reaction like that on my scalp. "My reaction to the tattoo hasn't affected my health in other ways, but I'm really upset that a silly bit of holiday fun turned out to be anything but. My black henna tattoo was supposed to be a temporary thing, but it has left a horrible lasting legacy." Watch Katy talk about her black henna tattoo, and hear from experts in this video from the Cosmetic, Toiletry and Perfumery Association.